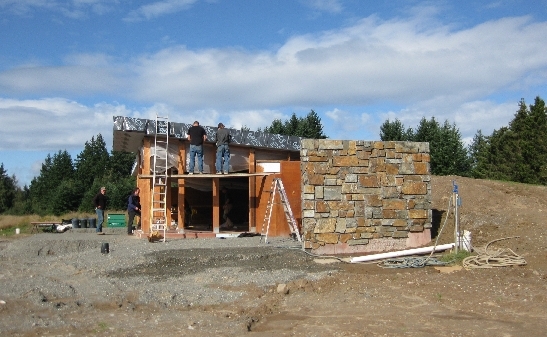 So, we’re having a passive solar bermed home built in the Pacific Northwest. You might not think that this would be a sensible venture (how often does the sun shine amidst cloud cover and rain?). But we have great southern exposure on this land, and all the calculations showed that we could have an effective passive solar home. Sure enough, with the windows in and tarps pulled off, we’ve discovered that the house works. Though temperatures have been below freezing to just at freezing, the indoor temperature (with no added heat!) is around 67 F. This is without the thermal mass even having had a chance to charge! So the massive insulation of the berm, plus a well-insulated roof, and the winter sun coming in through the windows is warming the house, and the house is holding in the warmth. Amazing! With the evidence that our home is now functional (if still incomplete inside!) we are now diving into plans for our move and what we’ll do when we arrive (around the Spring Equinox). I’m starting to plan our herb garden, kitchen garden, and a chicken feed garden — on a smaller scale then we ultimately hope to maintain (we hope in time to grow much of our grains and vegetables — we’ll see: many of the grains will be an experiment). And we are considering our farm animals. Definitely we’ll have our chickens, but we’ll also dive into ducks (rabbits — for eating — too, sooner or later). We passed some of this evening browsing breeds. Welsh Harlequin ducks strike my fancy. But so do the runner ducks, and several others …. Other family members have other favorites — like the call ducks …. So much fun to dream! This entry was posted in chickens, ducks and tagged Bermed home, Farm, Green home, Passive Solar, Sustainable living. Bookmark the permalink.